In the startup universe, college can be a distraction. Just ask Peter Thiel, co-founder and former CEO of PayPal and an early investor in Facebook. At the end of May, Thiel announced the first "20 Under 20" Thiel Fellows: Out of more than 400 applicants, he picked two dozen of the best (accepting four more than originally planned) to receive a $100,000 grant, access to a network of about a hundred high-profile mentors and two full years to begin turning their business hopes into reality. There's just one condition: You can't be enrolled in college at the same time. 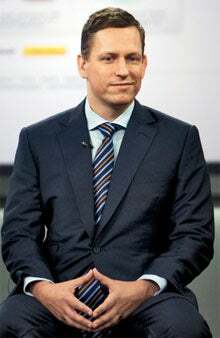 He's got teen spirit: Peter Thiel puts innovation to work. Among the appointees: Laura Deming, a 17-year-old biogerontology expert at MIT who wants to commercialize anti-aging research; and 20-year-old Andrew Hsu, a neuroscience Ph.D. candidate at Stanford who left earlier this year to start Airy Labs, which will create social learning games for kids. The best part? There's no pressure to pay it all back. "We're not taking equity in any business," says Thiel. "Most of the time people are constrained by money and social expectations to do things very quickly. … But buying people a few years encourages them to tackle bigger problems." It's become something of one, because young people coming out of college are saddled with student loans, which start tracking them into careers that pay well but are ultimately not going to help our country and our civilization. So you don't think entrepreneurship can be taught? You can't teach people a specific way to change things for the better. I don't believe people can become entrepreneurs as an aspirational thing. It's like saying you want to be rich and famous when you grow up--it's too abstract. The motivation is what's important. There should be a problem you want to solve, and in the process of solving it, you might have to become an entrepreneur. What made these first 24 teens stand out? Almost all were extremely passionate about a particular thing that they'd been working on for a number of years. We wanted people with very specific and concrete ideas of how to make the world a better place, on how to really move the dial--and then we will provide all the support that we can. How will you know if this investment is worth it? The plan was for people to think hard for the first few months on formulating ideas. An important thing for real innovation is not to be too narrowly tracked or given super-tight timelines. We ultimately won't know if it works out for another 10, 15, 20 years--but I'm willing to take this risk, and I appreciate their willingness to take a risk with me. My hope is that all of these ventures will succeed, but in the long term, creating friendships and relationships is how you build something of lasting value. I have been involved in hundreds of businesses as an investor or advisor over the years, and I'm very optimistic that this is where we should focus. My view is that there's no time that's the right time to be an entrepreneur. You don't have to be young or old, or have experience or be fresh. People can become an entrepreneur at any point in their lives. What matters is you have an idea or potential business that has the possibility to change the world.